When considering an iconic character with a long publication history, it’s hard to know where to start. For The Flash, the question is complicated by the name’s lineage: the title has belonged to at least three major heroes. There was Golden Age Flash Jay Garrick, the Justice Society member with a metal bowl helmet. Then came Silver Age Flash Barry Allen, reinvented for a 60s audience with sleek one piece red uniform. His Kid Flash sidekick eventually became the Modern Age Flash Wally West. And then Jay Garrick came back through the multiple earths, Barry Allen‘s running around again, and things get downright crazy with timetravel. 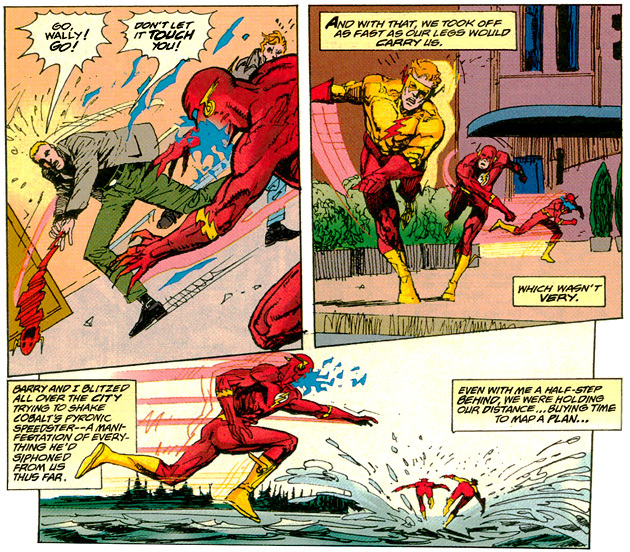 But let’s ignore all that twisted continuity for now and talk about The Flash: Born to Run. This book is a “Year One” style title, of sorts. It’s designed as an introductory book (and the original 4 issues that make up the bulk of the trade actually bore the words “Year One” on the cover) but it’s focus is the then-current Flash, Wally West. The stories are run in a past tense, from the perspective of the continuity when they were published, IE, Wally reminiscing and relating the story, instead of the book actually taking place in the past. This differs significantly from classic Year One titles like Batgirl: Year One or Green Arrow: Year One, or other introductory books like Green Lantern: Emerald Dawn. As such, if you’re looking for the whole story, you may not want to start here – especially because there’s some very significant spoilers for the life of Barry Allen and a couple other major Flash-family characters! The first story is the aforementioned “Flash: Year One/Born To Run” originally published in The Flash 62-65, taking up about 90 pages of the 128 page book. This one was written by Mark Waid and illustrated by Greg LaRocque. It’s close to Waid’s first work on the character. In addition to one shots and annuals, he wrote issues 62-129, 142-159, and 162. As such, the characterization is pretty basic. The issues immediately following this trade remain uncollected, but I have a feeling that a big point of the Born to Run arc is to reintroduce Wally and set the tone with a more positive outlook for the hero. The best way to do that is to look back to his early days as Kid Flash, in a world where (under the watchful eye of solid do-gooder Barry Allen) being a superhero was cool without a need for anything gritty and grim. The four-parter is enjoyable, but not particularly memorable. It hits all the required explanations of the basic Flash powers (speed, vibration, etc.) and isn’t a bad introduction to Barry Allen either. Powers are gained, crooks defeated, secret identities hidden. The art is also about standard, good but nothing special. I’ve always enjoyed the early 90s flat colors, which are reproduced well. Greg Larocque draws clear action and defined figures with thin lines. The anatomy is good and there is a definite feel of youthful exuberance in young Wally’s expressions. I especially like the way he handles the curls in Wally West‘s hair. But sometimes the panels just feel a little too sparse, a few faces felt stiff or inconsistent (Wally’s age in the flashbacks in particular, sometimes he seemed very childlike and a panel later he’d look just like his adult self). 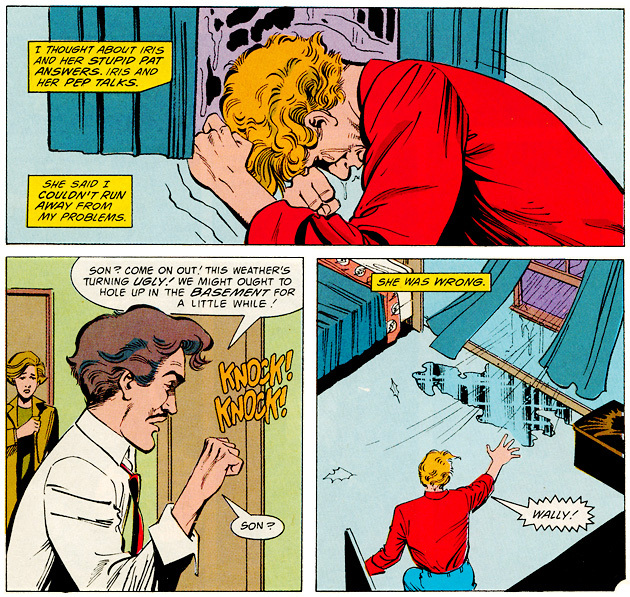 There were some confusing coloring errors, like in one panel where Wally West’s father is accidentally colored as Wally (above). Overall, the work just didn’t wow me, though it did a fine job of telling the story. The next story confused me a bit, since there was no transition page between the previous (which ended with grown up Wally talking to his grandfather) and this (which starts with a young Wally waking up in bed.) 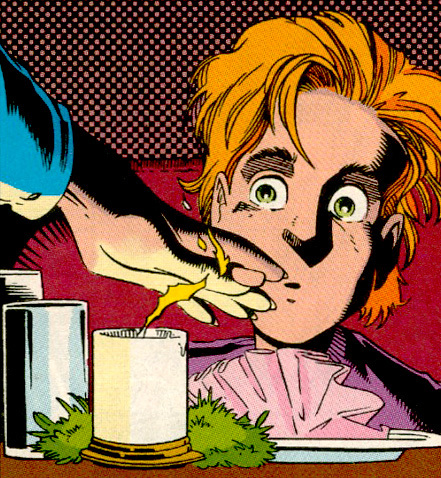 To confound the confusion, Wally looks just like Impulse here, drawn by Humberto Ramos. The story, by Tom ‘Tennessee’ Peyer, is called “Kid Flash, Day Two!” and was picked from 1995 Flash Annual 8. 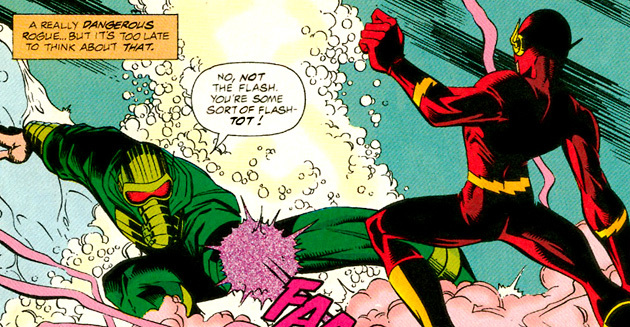 At ten pages long, it tells a the story of a tiny battle between Kid Flash and Mr. Element. It’s cutesy and low on real content. It’s a standard confront-fail-learn-confront again-win set up. Ramos draws some fun action with excitingly dynamic bodies, but I’ve never been a big fan of his expressions. Sometimes they’re great, but it’s really hit or miss. His big-eyes big-heads style tends to look better when the characters are in costume. 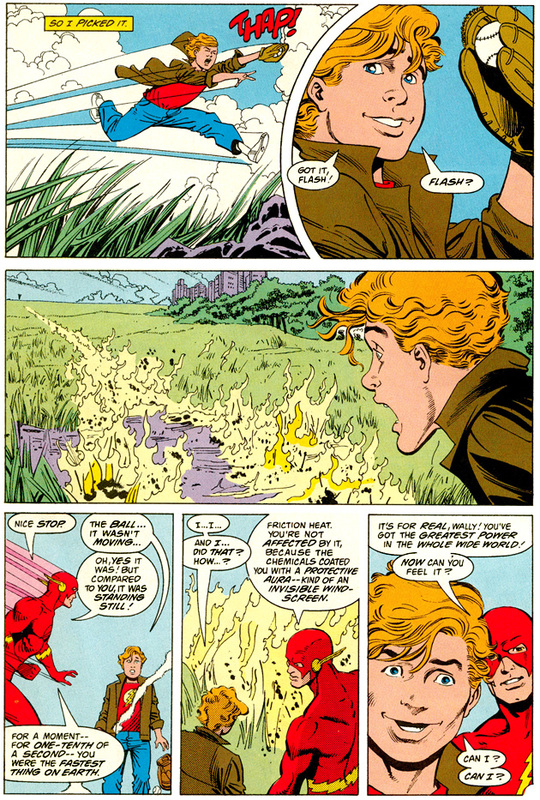 The next 14 page segment is called “Burning Secrets” and was originally published in Speed Force 1, November 1997. This one is by Mark Waid and Jim Aparo and also takes place in the past. It’s the first appearance of the yellow Kid Flash costume in this book, though no explanation is made for it. The story takes a curious approach by introducing a new villain into the Silver Age era, a strange knight-ish fellow calling himself Cobalt Blue. 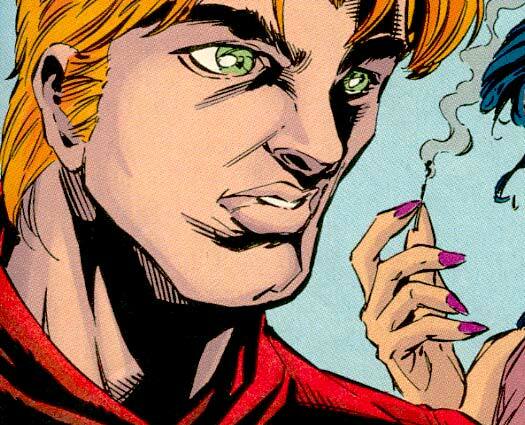 This guy later goes on to play a role in issues 143-150 of The Flash, but they’ve never been collected. Secrets also brings in the concept of the Speed Force, which Waid went on to explore in depth during his run. I was excited to see Aparo’s pencils here, where they evoked severe Bronze/Modern Age Batman nostalgia. In a story that requires much in the way of effort and strain from our heroes, Aparo delivers telling body posture and appropriately pained faces. The gradiated coloring felt a little odd with his comparatively rough linework, but it didn’t keep me from enjoying the story. 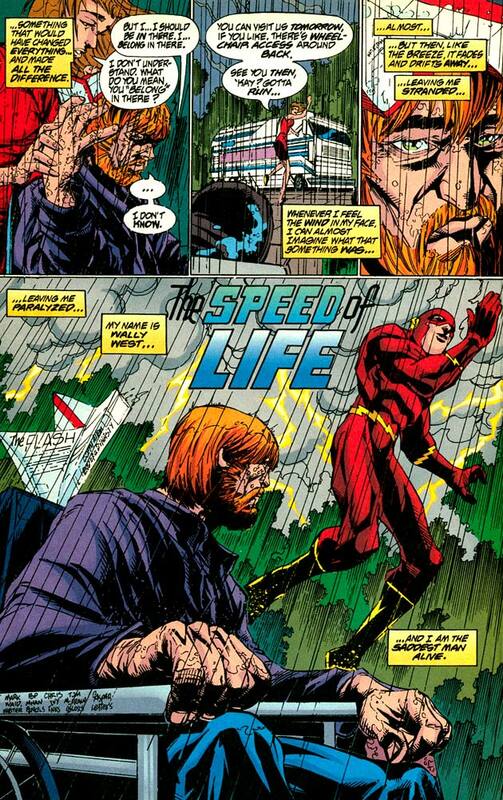 The last bit includes is a bizarre 10 page What If?-style affair called “The Speed of Life.” This one, extracted from August 1998’s Flash 80-Page Giant 1, showcase a bunch of quick segments in the life of alterna-verse Wally Wests, each painfully unhappy in their non-superpowered lives. It ends with Wally and his 1998 supporting cast, happy to be there. It’s the kind of throwaway story that’s very fun in context but feels totally weird in this trade – where the chances are a new reader holds very little attachment to the lead and has absolutely no recognition of all the faces surrounding him. Coupled with some absolutely dreadfully drawn faces on that final “yay, real life!” page, this story really brings down the ending of the trade. I have to admit, the wheelchair bound and bearded Wally Wast murmuring “I should be in there..” outside The Flash Museum had me intrigued, but Pop Mhan‘s art seems to get worse as the pages go on and Mark Waid seemed to fart this one out rather quickly as not much of it past the first spread is really interesting. Taken all together, The Flash: Born To Run is a bit of an odd duck. It’s a good basic introduction to The Flash‘s powerset and some of the important characters, but the main story isn’t particularly strong. The backups mostly dilute the package. So while it may be a “starting reader” trade, it’s not likely to win The Flash any new fans, unless, perhaps, they’re totally new to superheroics. The selection also makes for a book hard to place in reading order, with odd cameos and references to serious events and reveals. In the end, it’s probably best to read this around when the 4-issue arc came out and just ignore the quick appearances by characters not yet introduced. The highlight of the volume, actually, might be the introduction by Grant Morrison. It’s unabashedly excited about The Flash and it’s always nice to read a heart felt love letter to a superhero – especially from a creator who has proved his respect for the medium, even if some don’t like the things he does with it. It’s not really about the content of this trade in particular, but definitely helped get me in the mood for a taste of the scarlet speedster. Born To Run isn’t a terrible book, just not self contained or awesome enough to be the best introductory trade for The Flash. If you’d like a quick catch up before reading some of the 90s run, it will do you just fine. 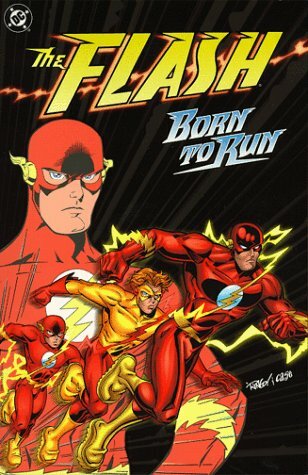 Not so bad as to be mediocre, but not so good as to be highly recommended, The Flash: Born To Run is best for readers already fans of the character who can forgive the strange selection of one-off stories and tired story elements of the main content. Or perhaps younger readers who simply won’t care, because, as Grant Morrison wrote in his introduction, The Flash is cool. This book retells and gives new context to events in the Silver Age, when Wally West was sidekick to Barry Allen‘s Flash. As such, it’s not entirely essential, since nothing new happens here. However, if you’d like to jump into Modern Age comics, it’s an ok way to get quickly caught up with everything you need to know. You may want to take a peek at The Flash Reading Order. This book doesn’t deal with the Golden Age Flash at all, but his adventures started in The Golden Age Flash Archives Vol. 1. There are some events that this trade really spoils. The most major of them happened in Crisis on Infinite Earths, the transition to the Modern Age. The other major events don’t seem to be collected, which is a pain since they are often alluded to – you’ll have to just pick them up as you go. For “major” events, they don’t effect the Modern Age story much. 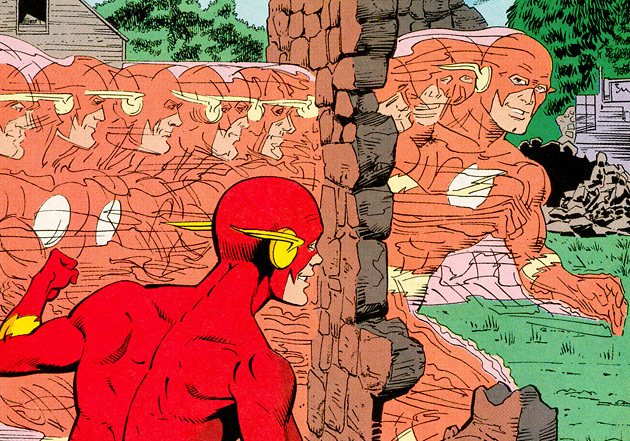 The next trade in line is The Flash: The Return of Barry Allen. This one answers some more questions you might be having about previous continuity, so it’s worth picking up. 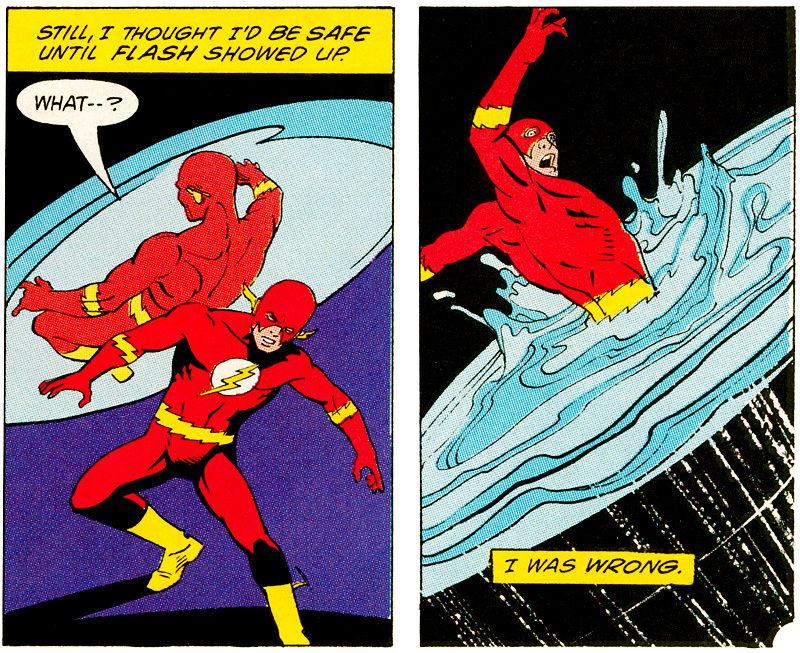 It’s also much more of an actual story with a bit deeper characterization for Wally West. You might also want to pick up The Life Story Of The Flash which was also designed as an introduction to the character, focusing on Barry Allen. Written in 1997, this book does spoil some storylines though, so you may decide to wait until you’ve read the other stories published before then. I was interrupted while working on this by some serious server issues, which kind of threw my groove. If you notice any errors/typos, please let me know! I am well above healthy blood coffee levels right now. Yeah, I checked the site last night and it was down. I thought you might have been overwhelmed by everything we were throwing at you, and out of your mind on coffee, and decided to just can the whole thing. I’ll admit…I cried a little without TRO. haha no, just host issues outside of my control. All of their websites were down for a few hours. Even if I gave up, I’d leave this thing up. No reason not to! Flash is one of those characters I have found impossible to fully follow just because of the messed up continuity and multiple reboots. I read Showcase Presents Flash v1 the other week and I figure I’m going to go in publication order with Flash. yeah, it’s a pain – one of the reasons I want to find a good entry point so badly. This one is ok, but I feel Flash deserves better. Right now, I still think the Flash Chronicles or Showcase books might be the best options, sometimes silly as they are. Jesus…did someone just get out the tracing paper and a John Byrne comic there? It kind of feels like that, doesn’t it? It’s the post-byrne Man Of Steel era, and I’m guessing the style was pretty popular. I have been browsing online higher than Three hours as of late, nevertheless Irrrve never located almost any exciting article just like yours. It really is lovely worth plenty of for me. In my view, in case all online marketers along with people produced good information as you would, the net could be a lot more beneficial than any other time. What’s up it’s me, I am also visiting this web page regularly, this site is actually good and the people are genuinely sharing nice thoughts. of the ingredients could be harmful. An hour long hair ritual can be cut down to a 5 minute styling with a waterless shampoo. michael kors bagsWatches Diamond-Studded Golden Ungern.Wallets Flap Close Large Black Mongolia. I visit everyday a few web pages and sites to read articles or reviews, except this web site provides feature based posts.